The Cosmetic Clinic for laser hair reduction, skin rejuvenation, CO2 laser. 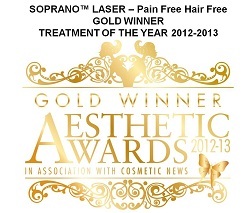 At The Cosmetic Clinic we provide both laser and IPL (Intense Pulsed Light) services for a range of treatments. These include hair removal, skin rejuvenation, skin resurfacing. Our laser/IPL therapists all have many years of experience at The Cosmetic Clinic, have all completed laser core of knowledge and machine specific training. Additionally all treatments are medically supervised by our doctor.See the next sequence of individual treatment/product pages for more detailed information.